Previously, high throughput microplate pipetting was only possible by investing in fully automated liquid handling robots. These robots are not only expensive, they are also complex and difficult to program, requiring specially trained users. VIAFLO 96/384 is the solution. With this 24, 96 and 384 channel pipette, INTEGRA meets the need for an affordable, compact and easy to use pipette that provides increased productivity. The unique operating concept makes VIAFLO 96/384 as easy to use as any traditional handheld pipette. VIAFLO 96 and VIAFLO 384 enable transfers of 24, 96 and 384 samples in a single step, thus increasing pipetting throughput and reproducibility significantly. At a fraction of the cost, they often surpass throughput capabilities of even expensive robots. VIAFLO 96/384 is a handheld 24, 96 or 384 channel pipette designed to fit on any lab bench. It features a unique operating concept making it as easy to use as a traditional handheld pipette. Hold the control unit and push to move the pipetting head to the desired pipetting position. This unique servo assisted steering mechanism allows fast, precise and stress free multichannel pipetting without the need for position programming. All INTEGRA electronic pipettes have a common user interface making it easy to switch between different systems without a second thought. A full color screen and proven touch wheel interface offer quick and comprehensible menu navigation. Simply by moving the finger over the touch wheel, menus and settings can be accessed and changed. VIAFLO 96 and VIAFLO 384 can be connected to a computer via USB port. With the free to use VIALINK PIPETTE MANAGEMENT SOFTWARE, user defined custom programs can be created on the computer and then be transferred onto VIAFLO 96/384. Users can simply change the pipetting head of their VIAFLO 96 and VIAFLO 384 to guarantee optimal matching of the available volume range to the application performed. Changing a pipetting head of VIAFLO 96 and VIAFLO 384 is easy and takes less than one minute. Each channel of a pipetting head is independent, having its own precise piston and sealing to exclude any cross-channel influences for error-free pipetting. With its compact design, this benchtop system requires little space on a lab bench and fits into most laminar flow hoods to allow work under sterile conditions. Up to three stage positions accommodate tip racks, microplates, reagent reservoirs or other SBS size labware. Up to 8 microplates can be stacked to make maximum use of the stage positions. Losing a tip during an assay preparation can ruin hours of work. Also a reliable sealing between tip and fitting to avoid dripping tips is of key importance for accurate pipetting. INTEGRA has redesigned the connection between pipette tip and tip fitting to eliminate these issues. The unique GRIPTIP PIPETTE TIPS are comfortably loaded and ejected without any physical effort due to a power assisted mechanism activated by a push button. The loading procedure also guarantees that GripTips are not touched by the user and remain sterile. VIAFLO 96 and VIAFLO 384 feature two deck positions (A and B) to accommodate different plate holders. The plate holders can be removed and replaced by another option any time to adapt the instrument to various application requirements. For 24 and 96 channel pipetting. The standard plate holder (6205) is used for simple 24 and 96 well transfers. The plate holder with slide function (6210) enables a grid offset to access 384 well plates with a 96 channel head. For 24, 96 and 384 channel pipetting. Available for position A (6215) and B (6220), these plate holders feature a spring load mechanism to secure microplates in place. Recommended for applications that require an exact plate positioning. Both holders also feature the slide function to access 384 well plates with a 96 channel head. Available for positions A (6223) and B (6224) these plate holders feature a slide function to access 384 well plates with a 96 channel head. A spring load mechanism secures the microplate in place. Both holders are adjustable in y direction to allow an optimal alignment of the pipetting head with the target plate. Recommended for 384 well plates with small wells, such as round well plates. Available for positions A (6225) and B (6226) these plate holders feature a slide function to pipet into 1536 well plates with a 384 channel pipetting head. A spring load mechanism secures the microplate in place. Both holders are adjustable in y direction to allow an optimal alignment of the pipetting head with the target 1536 well plate. For 96 and 384 channel pipetting. The stage provides three plate holder positions. Move the stage to the left and right to work with all three positions. It features the spring mechanism and slide function on all three positions The three position stage occupies both positions A and B and cannot be combined with another plate holder. In addition to serial dilutions in columns, this plate holder enables serial dilutions in rows. It works for 24, 96 and 384 well plates. 1536 well offset Spring loaded Adjustable Part No. "I would definitely recommend it to others. It gave reproducible results and was easy to use." "The device is very good for us in both time and money saving." 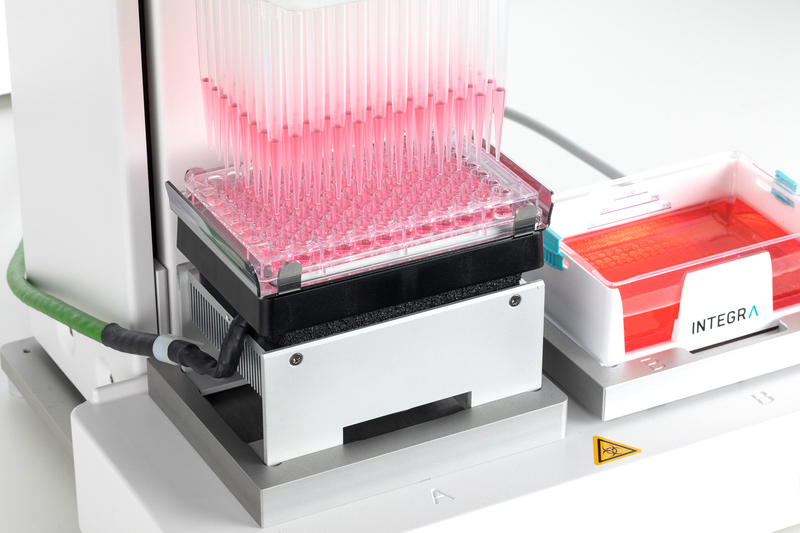 VIAFLO 96/384 fills microplates within seconds by transferring up to 384 samples simultaneously. It reduces pipetting errors and increases pipetting reproducibility as all samples are transferred the same way. The “Repeat dispense” function is an extremely effective mode to fill multiple plates with the same liquid: Aspirate once and dispense multiple aliquots of the same or different volume. Plates can be stacked during the process to minimize plate handling. An exact aspiration height can be defined to precisely remove supernatant. The ability to adjust the pipetting speed helps to gently aspirate without disturbing cells at the bottom of a well. Performing serial dilutions, mixing or resuspending contents of entire plates can be effortlessly accomplished without repeatedly pressing a plunger. The number of mixing cycles and the mixing speed can be exactly defined. Molecular Partners from Zurich (CH) integrated a VIAFLO 96 in their protein expression workflow. The pipette is used for various steps in their IMAC protein purification protocol. Integrating an INTEGRA VIAFLO 96 multichannel pipette into their high throughput expression facility has enabled Molecular Partners (Zurich, Switzerland) to streamline the discovery and development of a novel class of targeted protein therapeutics termed DARPins. DARPins are a next generation of protein therapeutics combining the advantages of antibodies and small molecule drugs. High target specificity and potency, small size, cost-effective production and a whole range of possible multi-specific format choices gives them the potential to surpass existing antibody drugs and revolutionize protein therapeutics. “Our lab is extremely satisfied with our decision to purchase and incorporate INTEGRA’s VIAFLO 96 into our development protocols. The main application we are using the system for currently is protein purification using IMAC (Immobilized Metal Affinity Chromatography). The VIAFLO 96 is used for various steps in the process starting from the preparation of bacterial cultures right through to the actual purification. Overall our protocol involves 63 full plate liquid transfers; such a workload would not be feasible with a traditional handheld multichannel pipette. We have found that the VIAFLO 96 is easy to integrate into our standard operating protocols because parameters can be defined: pipetting mode, volume, pipetting speed and pipetting height. We particularly like the repeat dispense function on the VIAFLO 96 as it saves the lab a lot of time and improves the overall reproducibility of tests as all samples processed at the same time in the same way". "Being responsible for training of new staff, I also appreciate that the VIAFLO 96 is user friendly and intuitive to use because very little training is required". PepsiCo Global R&D from White Plains NY (USA) uses a VIAFLO 384 to screen natural product libraries to find sugar substitutes. The 384 channel pipette is used to transfer compound plates to multiple cell plates. Using a VIAFLO 96 handheld multichannel pipette, the Institute of Genetics and Development of Rennes (IGDR) in France has been able to improve the efficiency with which they replicate yeast strain collections and perform genetic screens in 96 well plates. The Institute of Genetics and Development of Rennes (www.igdr.univ-rennes1.fr) is one of the major biological research institutes in France. The objective of the IGDR is to develop research of excellence in areas including Genetics, Cell Biology and Developmental Biology. Employing 20 teams of scientists – current research interests at IGDR include investigations into cell polarity, cell cycle, signalisation, membrane trafficking, RNA stability, splicing, epigenetics, genetics and transcription. IGDR also study human pathologies like cancers, and genetics and orphan diseases. “We purchased the liquid handler from INTEGRA Biosciences nearly three years ago and are very pleased with it. We use it to replicate collections and yeast strains and to perform genetic screens in 96 well plates. Thanks to the speed and efficiency of the VIAFLO 96 we can, for instance, replicate a whole collection of 5784 yeast strains in less than one week". "Our VIAFLO 96 has proven to be a great liquid handling device not only because of the speed and efficiency but also for its practicality. Set up is simple and operation intuitive. You can set-up a repeat mixing and dispensing application as well as change the aspirated liquid volume at any time. Moreover, its compact size allows you to fit it easily into any almost any laboratory space. I would strongly recommend the VIAFLO 96 for any type of 96 or 384 well plate applications”. Options to allow incubation at different temperatures. Heating and Cooling blocks which can be easily integrated into the VIAFLO 96/384 in order to help you perfectly control your application's temperatures. For more information about this product please contact your local sales representative. 96 and 384 well PCR aluminum cooling blocks to keep reagents in various PCR plates chilled. In addition, the 96-well cooling block can also accommodate 0.2 ml PCR tubes.